We had a good turnout for Book Club last night – with many thanks to the Blathwayt Arms for hosting the meeting again! This month we were discussing The Unexpected Inheritance of Inspector Chopra by Vaseem Khan. If you haven’t read the book yet, why not see what you think! After our chat about the book (plus a few drinks and one portion of sticky toffee pudding!) we agreed the next few books to read. 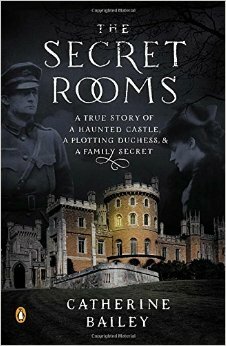 If you would like to join us next month for a discussion on The Secret Rooms by Catherine Bailey, please email bathwibookclub@gmail.com. A true Gothic Mystery. “Reads like the best kind of mystery story. It is a tale of mistresses and heirlooms, cowardice and connivance and a deeply dysfunctional family. Gripping” the Sunday Times. Yvonne Carmichael has a high-flying career, a beautiful home and a good marriage, but when she meets a stranger she is drawn into a passionate affair. Keeping the two halves of her life separate seems easy at first. But she can’t control what happens next. Solomon Kugel has had enough of the past and its burdens. So, in the hope of starting afresh, he moved his family to a small rural town where nothing of import has ever happened. Sadly, Kugel’s life isn’t that simple. His family soon find themselves threatened by a local arsonist and his ailing mother won’t stop reminiscing about the Nazi concentration camps she didn’t actually suffer through. And when, one night, Kugel discovers a living, breathing, thought-to-be-dead specimen of history hiding in his attic, bad very quickly becomes worse. Cast aside by his family at an early age, abandoned and left to fend for himself in the woods of Washington State, young Joe Rantz turns to rowing as a way of escaping his past. What follows is an extraordinary journey, as Joe and eight other working-class boys exchange the sweat and dust of life in 1930s America for the promise of glory at the heart of Hitler’s Berlin. Stroke by stroke, a remarkable young man strives to regain his shattered self-regard, to dare again to trust in others – and to find his way back home. Told against the backdrop of the Great Depression, The Boys in the Boat is narrative non-fiction of the first order; a personal story full of lyricism and unexpected beauty that rises above the grand sweep of history, and captures instead the purest essence of what it means to be alive. Her survivalist father, who has been stockpiling provisions for the end which is surely coming soon, takes her from London to a cabin in a remote European forest. There he tells Peggy the rest of the world has disappeared. Her life is reduced to a piano which makes music but no sound, a forest where all that grows is a means of survival. And a tiny wooden hut that is Everything. ‘Excuse me, sir, but may I be of assistance? Ah, I see I have alarmed you. Do not be frightened by my beard I am a lover of America…’ So speaks the mysterious stranger at a Lahore cafe as dusk settles Invited to join him for tea, you learn his name and what led this speaker of immaculate English to seek you out. For he is more worldly than you might expect; better travelled and better educated. He knows the West better than you do. And as he tell you hi story, of how he embraced the Western dream and a Western woman and how both betrayed him, so the night darkens. Then the true reason for your meeting becomes abundantly clear… About The Author Mohsin Hamid grew up in Lahore, Pakistan, and attended Princeton University and Harvard Law School. Moth Smoke, his first novel, was published in ten languages, won a Betty Trask Award, was a PEN/Hemingway Award finalist, and a New York Times Notable Book of the Year. He has written about world politics from a Muslim perspective for Time, the New York Times.